Add the remaining flour to the pan and cook for 1 minute, stirring. Add the frozen vegetables, Guinness, tomato purée, sugar, 1 teaspoon of the rosemary and 350ml of water. Stir until it boils then return the meat to the pan. Cover and place in the oven for 1½-2 hours, or until the beef is tender. While the beef is cooking, prepare the dumplings. Sieve the flour into a bowl, stir in the suet, the remaining rosemary, seasoning and 4-5 tablespoons of cold water. Mix together with a round-bladed knife until the dough comes together. Shape the dough into 8 dumplings, put back in the bowl and cover until ready to cook. 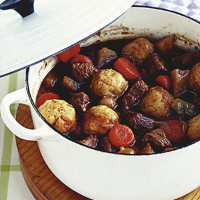 Use beef stock instead of water in step 3, to enhance the flavour. Substitute the frozen vegetables with fresh root vegetables such as swede, celeriac and sweet potatoes. Serve with Guinness, or try a spicy, mellow red wine from the Rhone with plum and black pepper notes.